A post (Write up ) that appeared in relation to my show 'Where the green grass grows'. I had forgotten to save in the blog. 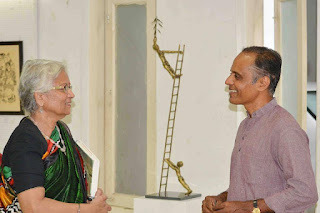 “The entire house is my creative space,” says Usha Ramachandran with a smile as I meet the artist at her residence at IAS Colony on Kavalloor Lane, near Kanjirampara. The house bears the stamp of its designer, master architect Laurie Baker. 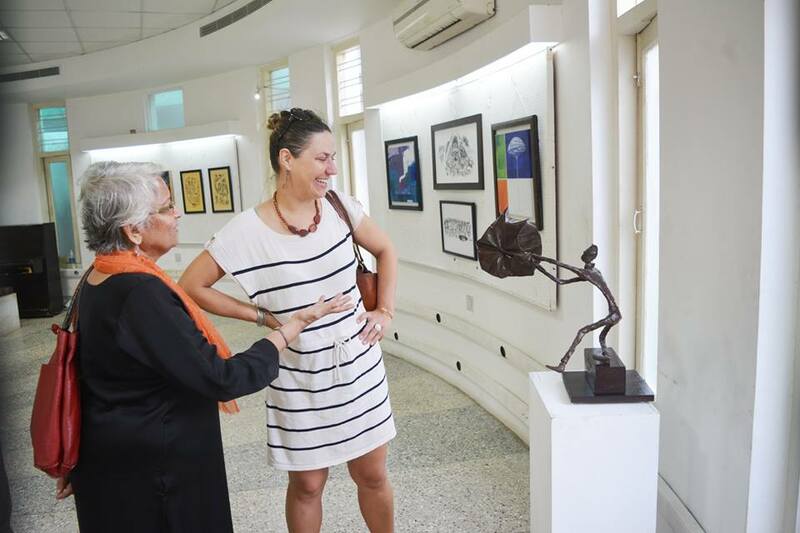 A wooden sculpture welcomes visitors to the living room while art works by Usha in bronze, wood and mixed media are aesthetically arranged on shelves, tables, and cupboards. Her paintings adorn the walls. “This house was not built with a separate workspace for me because I wasn’t an artist when he conceptualised this structure! We showed him the plot and went to Delhi and when we returned the house was ready. It has an open house plan and wasn’t meant to have any extension,” says Usha. But when Usha was nearing 60, she opened a new chapter of her life. 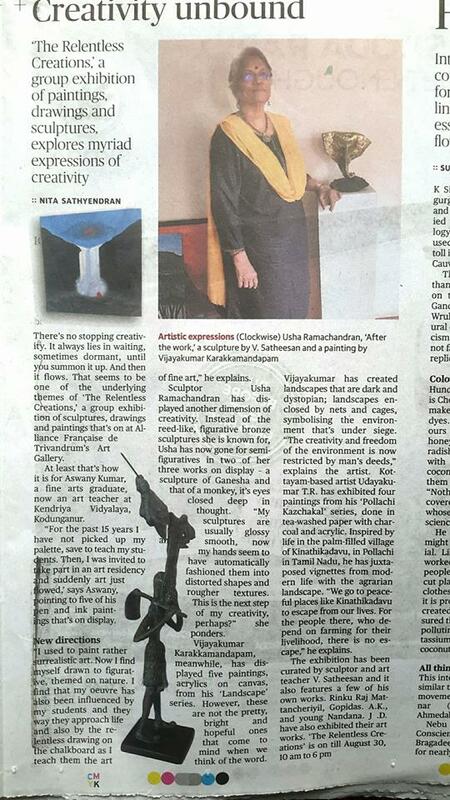 From being a self-taught painter, she found a passion in sculpture as well. Within a year she held her first exhibition of bronze sculptures. That meant she had to have a space to call her own at her house. A room was built for her on the first floor. 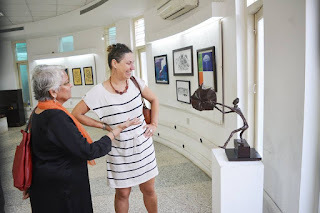 Her white overall, which she wears while at work, is hung behind the door while a few of her recent bronze works —‘Siva’, ‘Ganesha’ and ‘Krishna’ are arranged on tables in the small but well-kept room. A soaring ballerina in bronze is mesmerising. A cot and a couple of tables here and there make the room quite cramped. Her paintings lent a splash of colour to the white walls. “This is where I sit and contemplate. I get inspired by everything around me. 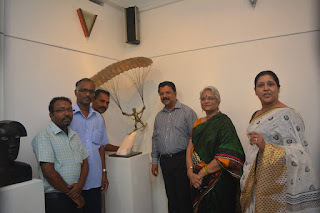 I am always thinking about my sculptures and paintings. When I was young, I escaped from the world outside into the world of books. Now my escape zone is sculpture and painting. This is part of my life, it is like breathing. I think about my works when I sleep also!” she says. The covered terrace became her workspace. 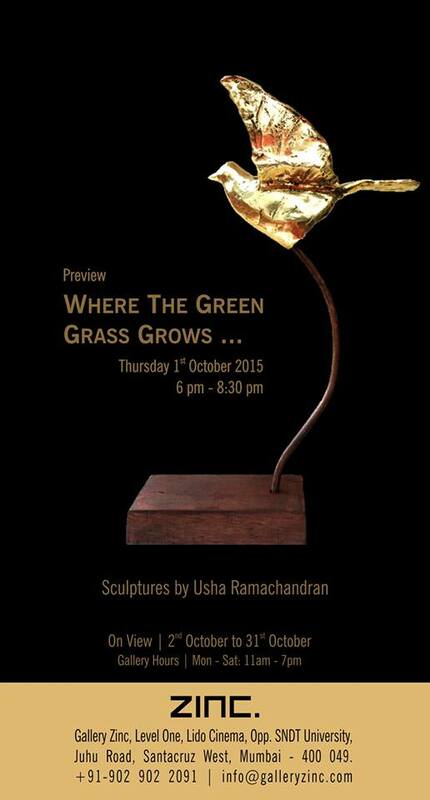 The breeze, the greenery, the quietude and the wooden swing are inspiration enough for the artist. It is easy to to ignore the clutter in the midst of so much greenery. Lying on the table is the bronze sculpture of a tree that can be divided into different pieces. “I have already made a bronze figure of a girl reading a book and that will be placed under this tree. It will be attached to this piece of wood with a screw. The sculptures are usually attached to a granite stone or wooden piece. In fact when I go out, you can find me looking around for stones or pieces of wood!” she smiles. Also on the table is a polished piece of teak that looks more like a rock from a distance. Her plan is to depict a rock-climbing scene, with the climbers cast in bronze. A locked cupboard stores her work tools — grinding and drilling machine, chisels, hammers, players, screwdrivers, sandpaper, screws and nails, brushes, glue, a pair of gloves, face guard... While she makes the moulds in wax, the casting is done at a shop in Chala. 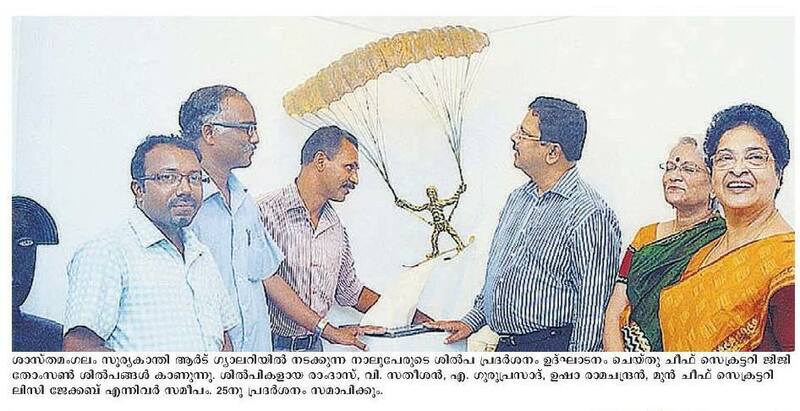 Usha handles rest of the processes herself. She proudly tells us that she learnt the process of giving the patina to her works on her own, by referring books and surfing the Internet. She finds time to work everyday and prefers to work mostly at night. “I don’t set a time frame to finish an art work unless there is an exhibition coming up. Actually it is good if I have a deadline because that motivates me,” she adds. It is a laborious process, but she enjoys every bit of it. It involves physical labour and one has to deal with a lot of dirt and dust. “You have to handle different kinds of acids and chemicals as well. 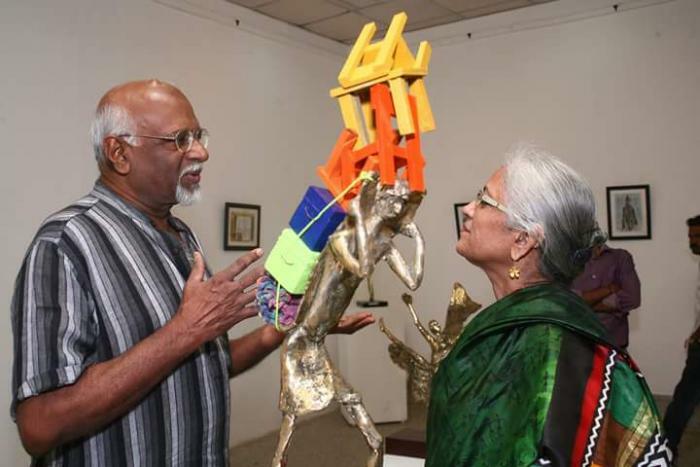 May be that’s why there aren’t many artists who opt for this and women sculptors are very few in number,” says Usha. But that hasn’t dissuaded her at all. In fact, she is planning to learn ceramic art as well. 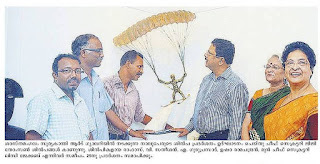 Inaugerated by Jiji Thomson IAS,Scief secretary ,Kerala. on 16th July. Usha Ramachandran @ Suryakanthi. from 16th to 25th July 2015. 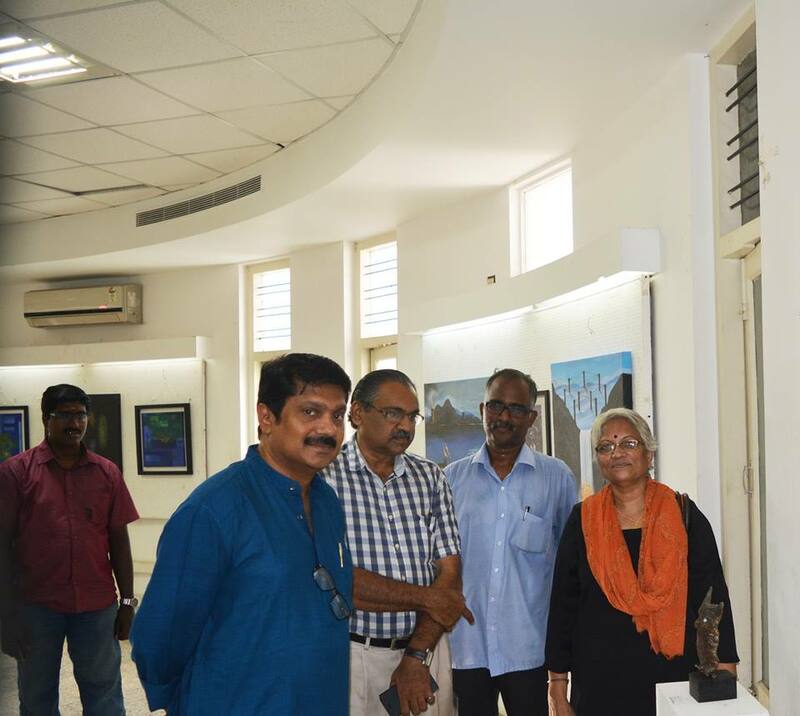 At Kashi Art Gallery ,Kochi with Anoop and Dorrie. Arrangement of sculptures and paintings . 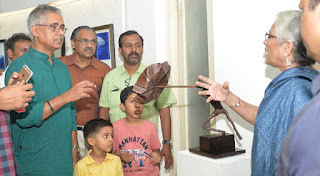 Sculprues.Bronze Sculptures.Art Gallery.Sculpture Display.Kochi.Durbar Hall Art Centre.